– one of the world's largest technology hackathons! Think outside the box and revolutionize dental care with Planmeca. Fresh and radical ideas and continuous research and development are the keys to technological progress. At Planmeca this is the rule we live and work by – and this is the reason we are also at Junction 2017. Planmeca is one of the world's leading health tech and dental equipment manufacturers. Digital revolution is transforming the entire field of health care and the possibilities of this transformation are limitless. Our mission is to make patient care better and safer by helping the health care professionals to give their patients the best possible care with the help of modern technology. Planmeca challenges the participants of this hackathon to embrace this mission, but throw away all limitations and think outside the box while doing so! Patient care is no longer just taking care of the sick but preventing them from getting sick in the first place. For health care professionals new technology is a way to more efficient, more accurate and more comfortable care. Digital solutions can move the boundaries of health and dental care – the care pathway can start long before the visit to the clinic and go on long after. With advanced 3D imaging technology we can already create a precise digital twin of the patient, which raises a question whether we even need a visit to the dentist any longer? There are two sides to this which we are especially interested in this particular challenge: the concept of a virtual clinic for patients and the virtual patient for clinics. Hack into the patient experience and make it more effortless and less interruptive for the patient. On the other side of this, we want to give the dental care professionals tools for planning and preparing care without the patient being physically present, which improves the patient experience but also increases precision and accuracy of care. Dive into the world of technology and use it to revolutionize dental care! Ultimately our mission is to make patient care better and safer by helping the health care professionals to make more accurate diagnoses and give their patients the best possible care. We want participants to embrace this mission, but throw away all limitations and think outside the box while doing so! Participants will have a chance to see and use real patient data in a form of a 3D virtual patient. Our mentors on site will coach participants and help them with any arising questions. Here are image data files for the teams attending our challenge. See the instructions for opening the provided sample images below and feel free to import provided data to your application. Together with Microsoft we’ll provide all teams with access to the Microsoft Azure cloud. In Azure, you’ll be able to use e.g. machine learning and AI capabilities, execute Azure Batch Blender processes and use Cognitive Services like Computer Vision. We’ll have Microsoft engineers on-site to help the teams with their projects. Digital Imaging and Communications in Medicine (DICOM) is a standard for storing and transmitting medical images enabling the integration of medical imaging devices such as scanners, servers, workstations, printers, network hardware, and picture archiving and communication systems (PACS) from multiple manufacturers. For opening the Dicom image files, it’s recommended to use Fiji. You may also use Romexis Viewer for Dicom files. Just drag and drop the Dicom file to Romexis Viewer in the start screen. If you use Romexis Viewer, you will notice, that radiologists usually view 3D X-ray images in three orthogonal planes: coronal, sagittal and axial. Each of them represents a thin slice of the patient’s anatomy. In addition, a rendered 3D view is shown at right bottom corner. These files are optical scans (or digital impressions) of the patient’s teeth and gums in STL, OBJ and PLY formats. The data has been acquired with Planmeca intraoral scanners. For viewing STL, OBJ and PLY surface file formats, use WIN10 3D Builder (included in OS) or Meshlab. These files include a virtual patient data set. This means a combination of three different 3D datasets (photo, X-ray data and digital impression) which form one complete 3D model of the patient. Planmeca was the first company to combine three different types of 3D data with one X-ray unit. The files which you can download below combined visualise a “virtual patient” in the Romexis Viewer. 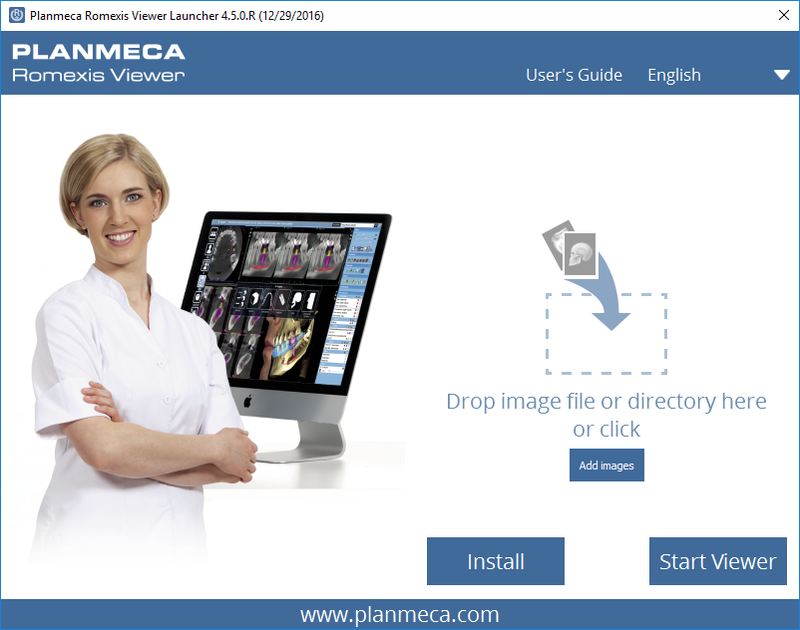 Just unzip the data set and drag and drop “Planmeca_Virtual_Patient.dcm” to Romexis Viewer start screen and press “Start Viewer”. 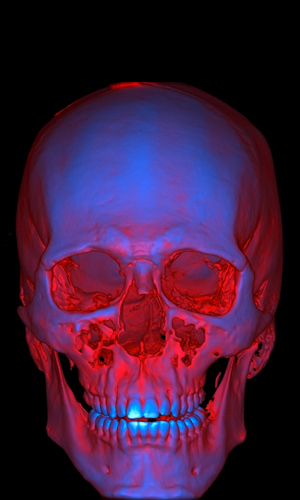 3D X-ray (Dicom) image of patient’s head, a ProFace 3D photo of patient’s face (OBJ) and a 3D optical scan surface (STL) of patient’s teeth and gums. STL surface scan is needed because gum surfaces are not visible in an X-ray image. “Dicom_obj_stl_Junction_virtual_patient.zip" , "Dicom_obj_stl_Junction_virtual_patient2.zip” Besides of Virtual Patient data, patient2 includes an additional Unity Ray Tracing sample.